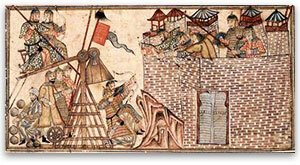 The Mongols surrounded the city walls. Genoese merchants hoped to wait them out inside the Black Sea trading city of Caffa. Technically these European merchants were guests of Uzbeg Khan of the Golden Horde. But the Genoese had become unwelcome. They repeatedly disrespected the authority of Islam and the khan himself. They dared to trade in Turkic slaves and had even summoned Italian troops to repel the previous khan’s soldiers. Now, when one of their own had killed a Muslim in the port city of Tana, these foreign "guests" defied the law by giving the murderer sanctuary here in Caffa, then refusing entrance to their hosts and rightful rulers at the edge of the Mongol Empire. This time, there would be no reinforcements from Italy. Instead, the Mongols would fall to the invisible arrows of a plague that had followed the Silk Road from the arid plains of central Asia. While the Genoese were safe within the city of Caffa, the Mongol bodies piled up outside its walls. In many respects, this scene was an echo of earlier history. The Greeks had fallen to plague outside the high walls of Troy, if Homer’s telling is right. The Bible says that Sennacherib ended his siege of Jerusalem because "the angel of the Lord went out, and smote in the camp of the Assyrians … and when they arose early in the morning, behold, they were all dead.…" According to the ancient Jewish historian Josephus, the Lord’s weapon was plague. But the Mongols of the Golden Horde did something unprecedented both in the history of warfare and the history of disease. They piled their dead into catapults and hurled them over the city walls, raining diseased corpses on the besieged Genoese. Unlike the Trojans and the Jews, the merchants were not on their home turf. And because Caffa was a port city, they could board their ships and flee the Crimea. It seems they brought the plague home with them. 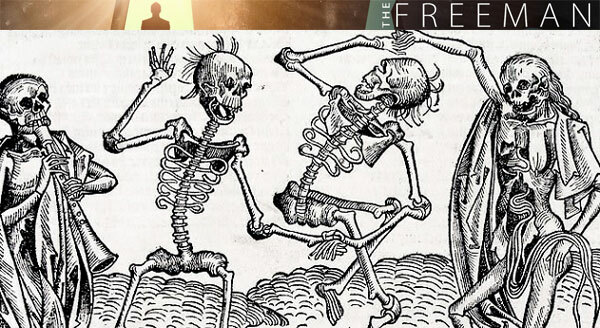 "If this account is correct," writes bacteriologist Mark Wheelis in a paper for the Center for Disease Control, "Caffa should be recognized as the site of the most spectacular incident of biological warfare ever, with the Black Death as its disastrous consequence." A century later, the population of Europe was only half the size it had been before the plague came west. But even if the disease reached the West by way of the late Mongol Empire, causing what Wheelis calls "the greatest public health disaster in recorded history," ultimate blame for the cataclysm may not fall to the Mongol khan or his soldiers. Instead we should look to the conduct of European monarchs — and one in particular. The plague and the Little Ice Age didn’t do Europe any favors. But the excesses of the State amplified the damage.